Today In Michael Beasley Is An Enormous Weirdo: "I Like To Fart Sometimes And Keep It N A Bottle 2 Smell Later"
Tipster Tyler C. alerted us to this wonderfully vivid mental image tweeted (and since deleted) by Michael Beasley. Beasley has indicated that his account was hacked, but who knows for sure. 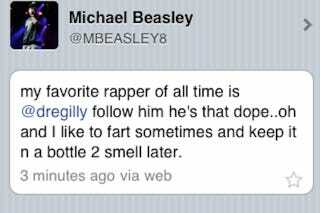 I suppose it's possible some rapper really wants the word out that Michael Beasley is a big fan and doesn't mind that Beasley is a gigantic weirdo who saves his own farts for a rainy day. If that's so, then, you're welcome! Whatever the case may be, though, let's all have a good long chuckle at the idea of Michael Beasley sitting in his home sniffing a bottle of fart air. Or maybe he just keeps it around as a mask for other odors? Update (5:22 p.m.): Booo. It was his old Kansas State teammate Andre Gilbert who is now "COMMITTED TO INK. (RECORDING/TATTOO ARTIST)." Still, I don't know that I want to listen to music vouched for—falsely or otherwise—by fart collectors.